By this point most people have seen the pictures of Marilyn Little’s horse’s bloody mouth. Which picture you might ask? Since there are pictures from multiple occurrences… Well this past weekend at Fair Hill multiple people saw and photographed evidence of ML’s horse RF Scandalous bleeding (not insignificantly) at the mouth. I contemplated my approach to this post for quite some time. There is the plain WTF aspect, the rules, and event the negative association I feel for the brands that sponsor riders that show a blatant disregard for their horses welfare. Additionally as an amateur I do not pretend to have the competency or skill to ride at the upper levels and normally do not feel appropriate casting stones but if amateurs like us can manage to event without having blood dripping from our horses mouths why can’t the supposed best of the best do it… Oh wait… most of them can. Obviously I am disgusted with the fact that ML’s horses turn up with bloody mouths but what adds insult to injury (literally) is that ML appears to be not only being rewarded for this behavior but it is going un-investigated. Amanda posted about this almost exactly a year ago and was accused of leading a “witch hunt”. Now that this has happened on numerous occasions with multiple horses will more attention be deemed appropriate? This is clearly not an isolated incident at this point. Many people seem to feel that the Ground Jury was just following the protocol outlined. Which fine, for whatever reason you didn’t stop the rider reported to have a horse streaming blood from its mouth. I am not trying to place blame on anyone besides ML really but what is absolutely mind blowing to me is how people are totally ignoring this incident. Just because you weren’t “caught” officially doesn’t mean it didn’t happen. Also when the groom of said rider carries a black towel around it should raise suspicion. If this is what her horses look like at shows what happens outside of the public eye? I think that the FEI Eventing rule book needs to be modified as such to remove the grey area or loop hole that makes it okay for this to happen. Yes, things do happen but at some point we need to consider the factors at hand. The constant is ML. Not the same horse, not the same bit, just her. There has to be a flaw in the system that this is going unpunished. 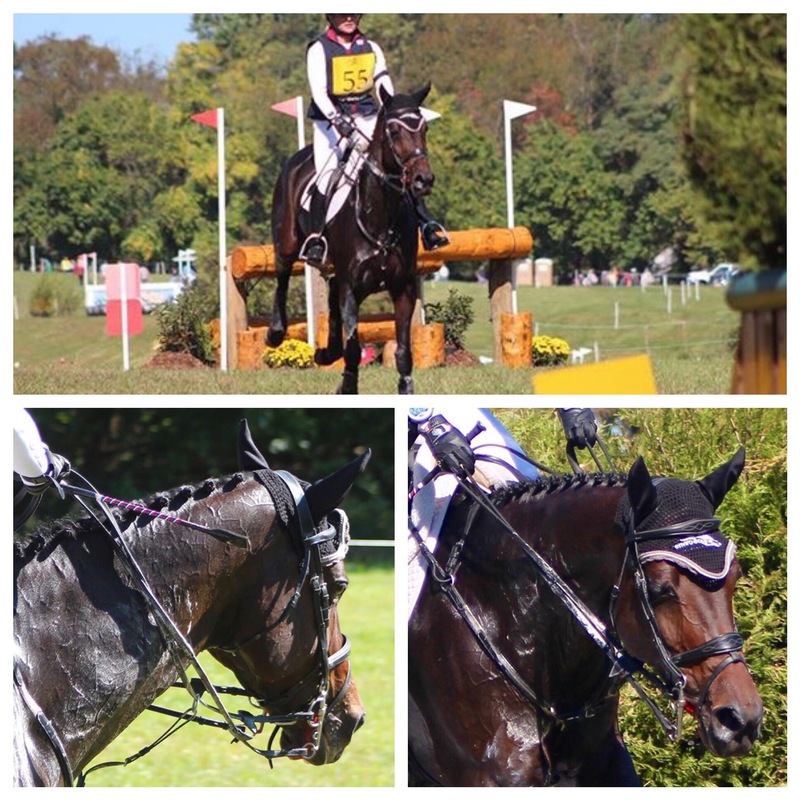 I think it is very interesting to note that when we look at the blood rules set by FEI for Jumpers (above) it is pretty clear that the horse showing signs of blood are to be pulled up. Even more interesting is how this rule is stated for dressage. There is a zero tolerance policy. Blood is final elimination. Do not pass GO do not collect $200. FEI Dressage Rule pg 51: Bleeding: If the Judge at C suspects fresh blood anywhere on the Horse during the test, he will stop the Horse to check for blood. If the Horse shows fresh blood, it will be eliminated. The elimination is final. If the Judge through examination clarifies that the Horse has no fresh blood, the Horse may resume and finish its test. If the FEI Steward discovers fresh blood in the Horse’s mouth or in the area of the spurs during the equipment check at the end of the test (Article 430.10), he informs the Judge at C, who will eliminate the Horse and the/Athlete. If there is blood on the Horse, an FEI Veterinarian is to be called to decide if the Horse is fit to continue in following competition(s) in the Event. If the Horse is eliminated pursuant to the above, or if the Horse is injured during the test and starts bleeding after finishing the test, it should be examined by an FEI Veterinarian prior to the next Competition to determine if it is fit to continue in the Event the following day(s). The decision of the FEI Veterinarian is not subject to appeal. I have to say that it makes me proud that other upper level riders are posting publicly their opinions on the matter. Maybe they will finally get someone to pay attention since mere amateurs apparently just lead witch hunts. That all said if any of us want a change made we need to do something about it. I am currently still trying to create a petition online that supporters can respond to that will be sent directly to FEI. Maybe if we raise a big enough stink with enough people something will finally be done? I’ve said this before in reference to animal welfare, but something I think equestrian as an entire SPORT needs to be very aware of is our perception to outsiders. Does the average joe see animal abuse or does he see just a normal day of the sport? I know it’s maybe not the best or easiest distinction to make in all cases, but if we hope to grow our sport and bring in more money for all levels, we HAVE to consider this. And a bleeding horse is not going to go over well with any animal lover. Yes to all of this. I was pissed yesterday as I watched the EN instagram and all these people liking Littles xc pic. Seems as if this morning people have come to their senses and her pic has like half the likes as the others now. Wake up people! I think the rule needs more clarity. 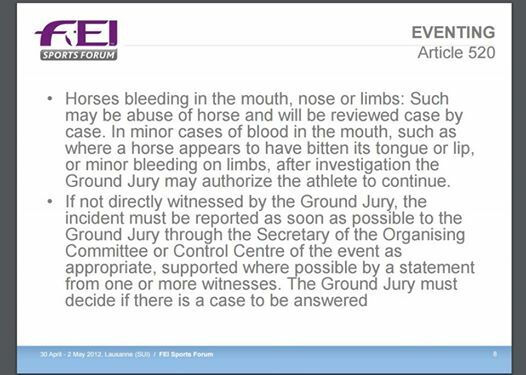 Right now it’s so subjective and ambiguous, that the Ground Jury has no set protocol to follow in the event of blood sighted (Do they have to pull the rider up on XC or can they finish? etc). I don’t think it would harm too many innocents to have eventing follow that of other disciplines and adopt a zero tolerance policy. Yup. If this is what following the rules looks like, the rules need to change. It’s bad enough that you have (occasional) horses dying on xc, but now the winners are bleeding too? Nope. Not ok.
I’m mystified by how many people are willing to close ranks around her and attack those who question it, but at least this time a few prominent riders are starting to speak out. The whole thing disgusts me. This is a pattern with this particular rider and it needs to be addressed immediately. I am thoroughly disgusted that this is “allowed”, and although I am also hesitant to cast stones at those who clearly know more than me, I’ve had about enough of this. ENOUGH. Thank you for writing about this, I know it exposes you to criticism but it’s important that all our voices are heard. Horses bleeding from the mouth is ML’s trademark, and I doubt many who saw it had to think hard about who the rider of the bleeding horse was. That, in itself, is indicative of a serious problem.